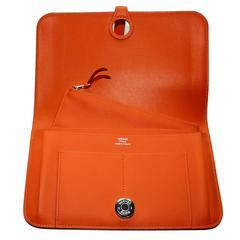 This incredible wallet was made by Hermes in 2004. 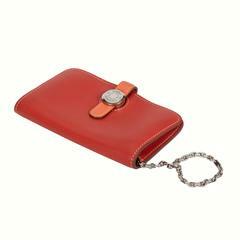 Made from their signature alligator skins in a rich honey or Miel color, this wallet features white contrast stitching and fastens with a gusset. The interior is lined in matching honey goatskin. Measures 3.5in x 7in. Gusset expands to .75in. 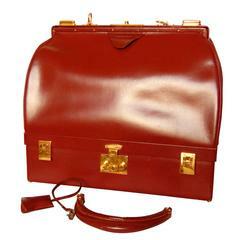 Gold plated 'H' tab closure, the interior features 5 credit card slots, 4 additional pockets, and change purse with zipper. In very good condition for its age, we note some pulled exterior stitching at one side (see image 7, foreground photo on your left) and some scratching to the gold H hardware. Note that this piece was cleaned and conditioned by Hermes back in 2012, and we'll include the receipt for the new owner and the CITES certificate. Stamped H in a square, indicating a 2004 year of production. Comes with its original box. In very good condition overall, some pulled exterior stitching at one side (image 7) some scratching to the gold H hardware. Note that this piece was cleaned and conditioned by Hermes in '12. Cites incl. 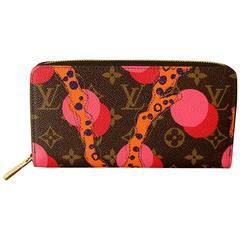 Hermès rose azalee and orange coin case with palladium lock zipper. Brand new. Date stamp C for 2018. Comes with original box and ribbon. 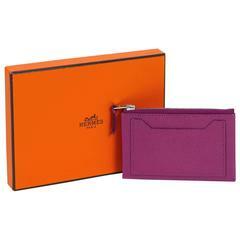 Hermès cattleya purple chevre card wallet (goat skin leather). Date stamp I for 2005.Comes with original box.